Kumiko is afraid of going to bed. She is afraid because of the dragon who waits outside her bedroom window every night. One day, she decides to write the dragon a letter asking him to go away. But even this doesn’t make her feel braver. 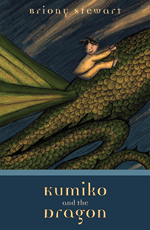 What happens to Kumiko next is thrilling—in one night she learns a great deal more about dragons, her family, and being brave. Will the dragon eat her, or is this the beginning of a great adventure? This book was an exciting read, and I loved Briony Stewart’s illustrations scattered throughout the chapters. Rebecca borrowed this book from her local library. Ask if they have it at yours, too! I haven’t read it but how can you go wrong with a good dragon?